Deluxe Brown Leather - Nail & Tool Pouch - 3 Pockets - Connell of Sheffield. Three pocket pouch - multi-purpose pouch. Pocket sizes: 24cm x 21cm, 23cm x 17cm and 14cm x 10cm. 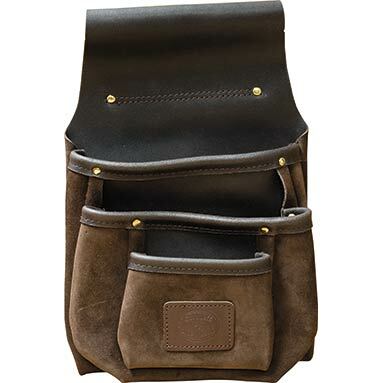 Deluxe brown leather carpenters / tradesman's tool pouch. Made from top-grade, premium moss-backed, chocolate brown suede from British tanneries. Stitched with rot-resistant nylon-bonded thread for extra strength and durability. The backing on the suede helps the pouch keep its shape and helps prevent stretching. Designed to be used with any standard 2" wide belt.